Summary: Kate Vaughan is no stranger to tough choices. 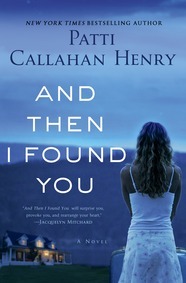 The She Reads network selected AND THEN I FOUND YOU by Patti Callahan Henry as its April pick. Once again, I'm not entirely sure that I would have read this book on my own since it isn't exactly my normal reading fare. While I do enjoy women's fiction, I was worried that it would be too much of a romance/love story for me. However, a big part of me was drawn to the story because it was based on a true story about the author's sister. AND THEN I FOUND YOU tells the story of Kate, a woman who seemingly has it all. She owns her own business and is in a serious relationship with Rowan, a good guy who truly loves Kate. However, when Kate discovers a ring box in Rowan's drawer, she begins to question if she's ready to commit. It becomes obvious to Kate that she needs some closure from some events in her past before she can happily move on. So Kate decides to track down her first love Jack -- the man she fell in love with as a young teen. And more importantly, the father of the child she gave up for adoption. Kate and Jack had been having a few difficulties in their relationship when they were living apart, but had a one night stand and Kate ended up getting pregnant. In the months following their encounter, Jack married the woman he'd been seeing; and Kate felt it best to give up her daughter to a family with both a mother and a father. When Kate finds Jack, her old feelings definitely come rushing back to her; and though she's determined to move forward with Rowan, her heart isn't cooperating. In the meantime, Kate's daughter decides that she wants to meet her birth mother; and she ends up finding Kate on Facebook. Kate experiences a huge range of emotions and is forced to make some tough decision about her future. And she also learns that you can't ever let go of your past. As I'm sure you can tell from the brief description of AND THEN I FOUND YOU, this novel deals with some very serious issues and it has its fair share of ups and downs. You can't help but feel for Kate, Jack and their daughter; however, I'm not entirely sure that I loved this novel. There are parts of it that I thought were very well done, and then there were some parts that didn't work as well for me. I have no doubt that I am in the minority with this opinion though. I have a feeling that most people with love this touching story. One thing that made this book special to me was that it was inspired by real life events in the author's life. Like Kate, Ms. Henry's sister actually gave up a child for adoption only to be reunited with her twenty years later. In a strange twist, Ms. Henry's niece actually found her on Facebook and requested to be friends. The family could hardly believe their luck when they realized this girl had the same birthday as the child who had been given up for adoption. They always say that real life is stranger than fiction, and I think Ms. Henry had to base a novel on this experience! Another aspect of the story that I really appreciated was how it addressed a woman's choice to give her child up for adoption. I truly believe that it's an extremely generous gift to both the child and the family who receives the child; and I loved how the novel explored the sacrifice that is involved in such a difficult choice. Even though it appeared that Kate had moved on with her life, not a day went by when she didn't think about her child and wonder how she was doing. I believe that the author's portrayal of Kate and her feelings was extremely accurate. I also liked how AND THEN I FOUND YOU explored the effect of adoption on families. And by that I mean the family of the birth mother as well as the family who adopts a child. Not only was Kate still reeling from her decision, but Kate's entire family was affected by not getting to know their grandchild or niece. In addition, the family who adopted Kate's daughter had to deal with their daughter wanting to find her birth mother. I can only imagine the fear and insecurities they had in letting their child meet her birth parents. While I appreciated just about everything having to do with the adoption parts of AND THEN I FOUND YOU, I did have an issue with some aspects of Kate's personal life. I could totally understand her difficulties in letting go of her daughter, but I was frustrated at times with her fixation on Jack. I guess I'm not a romantic because I actually got angry with how she treated Rowan. I thought she was unfair to him and even rude when she didn't contact him, and I guess I felt he deserved more than that. Not that Rowan handled the situation perfectly, mind you, but Kate did keep some pretty huge secrets from him. Because AND THEN I FOUND YOU deals with so many serious topics, it would be an interesting book club selection. There is a reading guide with fifteen thought-provoking questions that might help stimulate discussion, although I think it would be pretty easy to find topics to discuss on your own. Some of the themes you might want to explore include adoption, love, secrets, forgiveness, redemption, families, closure, and second chances. One thing I'd love to learn in a discussion of this novel is whether any other readers felt the same way about Kate as I did. There is no doubt that AND THEN I FOUND YOU is an amazing story -- even more so because it's based on real-life events. Recommend to fans of women's fiction and book clubs. Thanks to the publisher, Wunderkind PR, and She Reads for providing a review copy of this novel. I just skimmed this because I have it on my reading list for She Reads. I'm not convinced that it's my kind of book. I enjoyed this book...read it in just a few days which is rare for me. I did have a niggling issue with how Kate wanted it all. She wanted Rowan, she wanted Jack, she wanted the daughter, irregardless of other people's feelings. I'd say that is probably typical, but it made me irritated at times. Beyond that, though, the message is uplifting and I love the fact that it is based on a true story. Hmm, I can't decide. You were convincing me, but then you had doubts, and I tend to agree when you have doubts! And then Sandy had objections. Sounds like a really good story though! I'm intrigued by the fact that this book was inspired by a story from the author's family. I'll be reading it soon. I've come back to read your review carefully. You really nailed it. I'm in totally agreement. I didn't really realize it when I was reading it but it's true that Kate did want to "have it all." I wouldn't have chosen this book on my own but I'm glad I've read it. I will recommend it to other friends that I know like this type of story.